We started off needing a bathroom remodel because the faucet was leaking heavily. It started as a slow leak, maybe a few years ago,… and we had a plumber look at it to fix it, but he said he would have to blow out entire wall to fix it. So we said we’d wait until we wanted to redo the entire bathroom. Well that day had finally come! YAY! The contractor coordinator said she was unhappy with the variance of colors in the tiles we selected. See examples of what we picked out below. The floor was to be darker brown, the walls, a light tan, along with some matching floor and accent tiles. So they “returned” the original order of tile, and got a new a batch. This new batch was SUPER LIGHT compared to the original. So, the top half of the bathroom was white. OK, fine, i didn’t think anything of it. 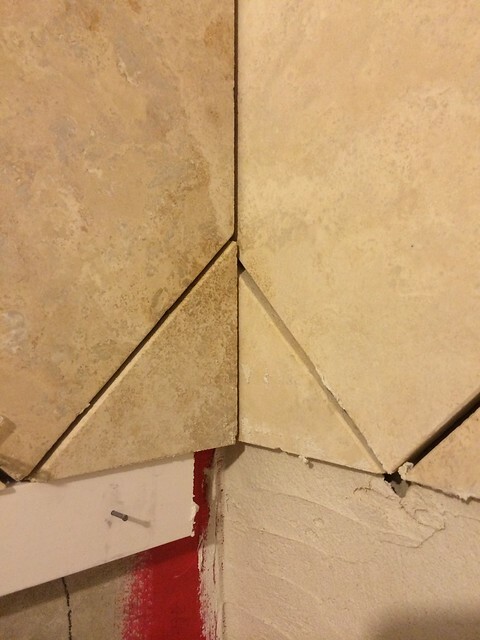 The bigger issue was that they contractor / tile worker, didn’t line up the corners so that they met at the same spot. This bothered Jeff immensly. I didn’t care that much either way, which is totally surprising because this is opposite behavior from us! We asked them to rip it out and make sure they lined up. They agreed. Fine. But when they redid the tile, they had to “reorder” the tile, since they used it all up. 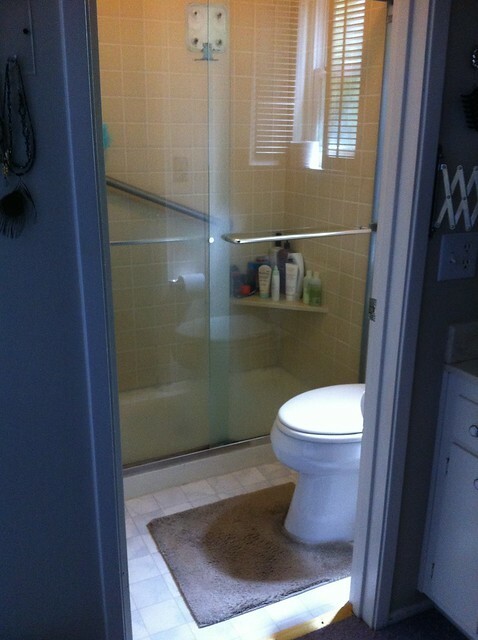 Oh wait, they still had the “dark, mismatched” tile that they returned initially. OK, lets use that… Fine, except for now, we had one back wall (top_ with all light, side walls with all dark (top) and mismatched in a very obvious way on the bottom! So, we had to direct them to rip out certain ones so that it just looked “random”. Also, they put in the wrong floor tile initially. They used the wall color on the floor instead of the dark color we picked! It was turning into a bit of nightmare, and the project took almost 3 weeks. Needless to say, we arent using these guys again, though we had initially wanted to do the hall bathroom with them as well. I mean really… don’t these people do this for a living? 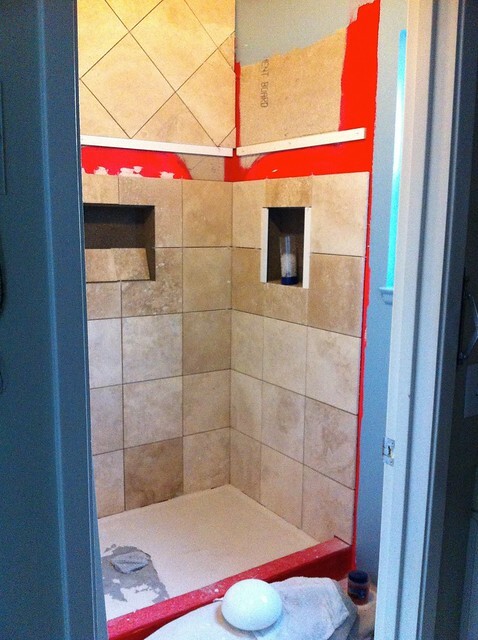 Dont you know that natural tile had variances and that you should always order more than you need and make sure to “mix” up the tiles in the boxes so it doesn’t look funny? Now i do….lesson learned. « Melanie is 7 months old!